Aaron Renn at the Urbanophile has been looking at the devastation wrought on different cities by highways. And he’s uncovered a pretty dramatic example in these pre- and post-highway photos of Cincinnati’s West End. It’s almost unrecognizable, but on the left in both photos you can see Cincinnati’s in-tact Union Terminal train station. In the later version, a lovely City Beautiful-style plaza in front of the station has been converted to parking. Much of the rest of the area has been converted to industrial parks. Over the Rhine is one of America’s most stunning historic districts. When I visited the city last year, one of the locals explained that there had been “miles” of neighborhoods just like it obliterated by freeway construction. I found this difficult to credit until I came across the photographic proof. If the West End was still walkable and people-centered, would it be undergoing a renaissance today like Cincy’s Over-the-Rhine? We’ll never know. Elsewhere on the Network today: Mobilizing the Region reports that Camden, NJ, recently cut the ribbon on a series of active transportation projects funded by a federal TIGER grant. The Green Lane Project shares a graphic showing which American cities have both protected bike lanes and bike-share. And Second Avenue Sagas posts some intriguing fantasy maps of New York City subways. Go into Union Station. One of the museums there has a huge scale model of Cincinnati neighborhoods in the old days, when Cincinnati was an urban place. People spend hours gawking at it. It’s amazing. Watch any motion picture from the 1910s through the 1950s that was filmed on location in any city, large or small and the difference in the public spaces screams out at you. Every time I’ve ever gone to Cincy to go out, I actually mean Newport, KY. Does Cincy proper even have any tourist areas? Good Lord, Angie. That title scared the crap out of me till I figured out what you meant. Plenty of tragedy to go around, but it isn’t just the Interstates plowing thru. The gorgeous Art Deco Union Station was the centerpiece here, with as many as 214 trains a day in its heyday — before this country decided to ditch our passenger trains. (Wonder how many bus lines stopped at the railroad station?) Now Cincinnati is “served” by THREE eastbound trains per week, arriving and departing around 1:20 a.m., and 3 westbound trains stopping around 3:20 a.m. Daily service would help, but unless and until Indiana agrees to help fix up the tracks Cincinnati-Indianapolis-Chicago, the remarkable Union Station will remain a home for museums. In short, the bulldozers were used to commit more crimes than just building Interstates. Which states’ DOTs are doing it right, and how? There’s enough of this sort of 50s destruction in San Francisco and Oakland to practically do me in as it is. I can’t possibly take on Cincinnati’s mistakes too. Just driving on Golden Gate in SF is enough to kill any sane person. Having the Paramount, the gorgeous Fox and the Grand Lake theaters still around will have to be enough for me. Here is an image from Google Earth with a similar perspective. Look at that image from a the city budget’s perspective: way more infrastructure to maintain, way less activity, way fewer people. We’ve become far richer as a nation, but we’ve spent all the riches creating environments like these, sparing no expense. Now what? Many of those buildings looked like cheap dirty tenements or outright slums. They should have been cleared, with or without deployment of new transportation infrastructure. People lived in those buildings. Frankly, 19th century tenement buildings were much better than some of the housing we have today, especially the decaying shacks which poor people have been relegated to in rural areas. I can’t believe anyone would actually support “slum clearance” in the present day. Best is probably Vermont, by most measures. Worst? Lots of competition. Shocking comparison. I’ve always wondered whether the highway planners of the early postwar era were morally enabled in their interventions by the saturation bombing campaigns in Germany and Japan just a few years before, especially as some of the same men were involved in both enterprises (not the least of whom was Eisenhower himself, though he was purportedly dismayed to learn that his own highway bill was resulting in road-building in urban cores). Not to say that the planners took delight in this wanton destruction, but that there was a certain indifference to the scale of the devastation and its human consequences that seems difficult to account for, and which was not nearly so evident in the early urban renewal initiatives of the 1930s, nor in the period after 1970, for the most part, which maybe not coincidentally coincides with the rise of the anti-war movement. Many tenements build before the turn of 20th Century were extremely overcrowded places where they even didn’t have basic sanitation facilities (meaning: different families had to share a bathroom down the hall). 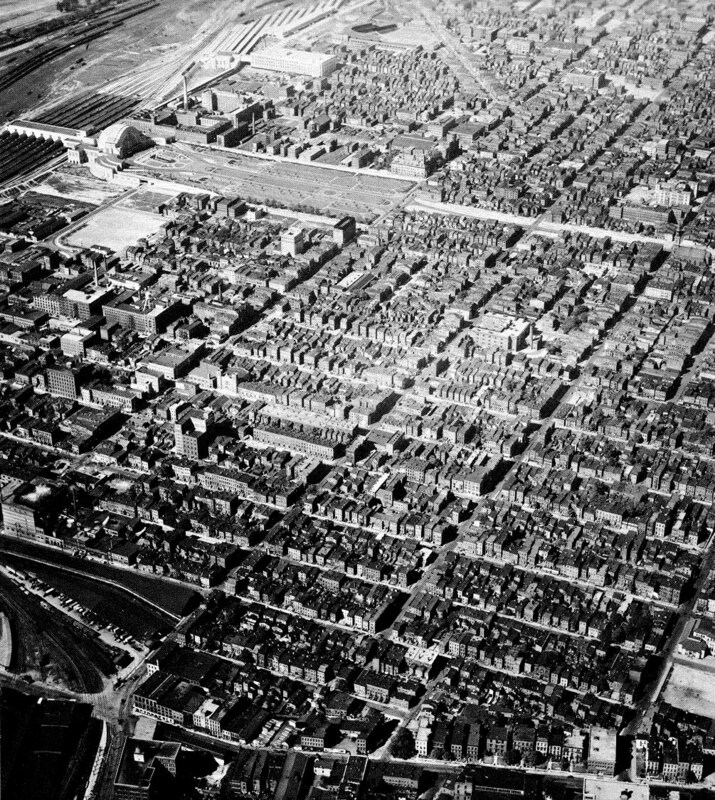 Large swaths of central Cleveland were fast turning into slums during WW2, before they started to clear some blocks for highway building. Actually, it was the dilapidated and low cost of property for ROW acquisition that enticed and determined the routing of many urban freeway routes first place. I don’t think you know athat “didn’t even have basic sanitation facilities” means. I’ve been to rural places which didn’t have basic sanitation facilities. The tenements were vastly better. You have to remember that the tenements were often built, originally, as *improvements* over the *actual* slums which existed beforehand — the sort of slums you still see in Mumbai. And the sort you still see in rural areas even in the US. I’m currently reading “Cincinnati’s Incomplete Subway: The Complete History” by Jake Mecklenborg. Instead of a subway, they got this? I have to shake my head. 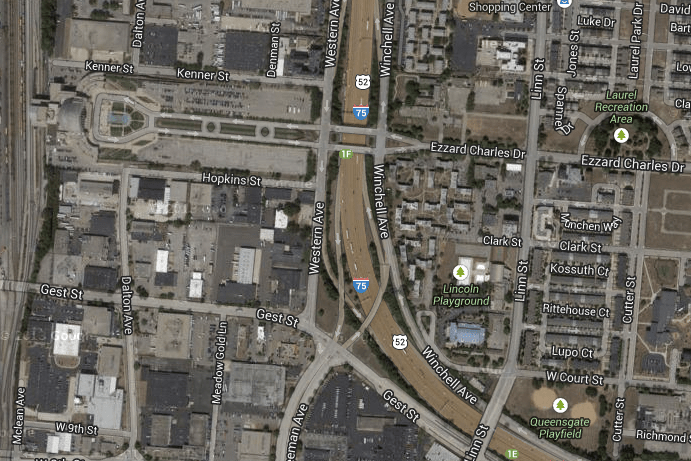 Why was not the freeway routed to the west instead along, atop or below that large railway right of way instead? bit more complicated than freeways. the inner city areas became poor after whites moved out to burbs, which blacks were barred from. then black uprisings (or riots as sometimes called) chased all the rest out. urban clearabnce began often as a way of avoiding property taxes – hence vacant lots in every US city centre. its heartbreaking, but racism and history is at the core. These before-and-after photos show how much the city changed in the span of a few generations.